Status: Located; Service record shows the action Company D saw during the Civil Ward. Thomas George and his brother Patrick both enlisted together, with Thomas surviving the action but Patrick was killed near Knoxville, Tennessee. States he was buried in the Burk Cemetery; which is located several hundred feet from the west boundary of his farm. No record of his burial is found in the original Sextant's documentation; but this DAR record authenticates the belief that he was buried here. Commencing at the southeast corner of street sixteen on the original plat of the town of Roanoke, in the said Huntington County—thence running east in a line with second street in said town of Roanoke to Commercial Street one chain and twelve links—thence a north east course along Commercial Street to Third Street four chains thence west along Third Street to the northeast corner of Street Number Thirteen, on said original plat of Roanoke—two chains and fifty links thence south along the east line of Lots numbered 13, 14, 15 16 to the place of beginning—three chains and seventy links containing one hundred and twenty six square rods of land, more or less. And being that part of the mill lease (leased by the trustee of Wabash ad Erie Canal to Samuel G. Jones from the first of November 1846 to run thirty years, on which the dwelling house for the use of the mill on said least is situated together with all the privileges and appurtenances to the same belong. In the description above, 126 square rods = 34,303.5 sq. feet, or 0.788 acres. Email from Stewart Dukes Clarifies birth date and other information. Provided detailed information about North Reston, Lincolnshire. From "The History of Whitley County"
This entry details the military service of Joseph Fries and Franklin Freese; both listed side by side in this document. The name Franklin Freese appears on the Civil War memorial in front of the courthouse; but it does not contain the name of Joseph Fries. Even with differing spellings of the Fries surname, after a thorough examination of many records it is believed that these two were brothers. There are conflicting records found in the Civil War records found on Ancestry.com; with one showing Joseph Fries was mustered out at the close of the civil war; and one record indicates he deserted. If he fought with General Sheridan against the indians after the Civil War, as stated in letter by Leo Joseph Fries, then it is unlikely that he was a deserter. Joseph also went on to be a constable in Illinois, before settling with his wife to an agrarian lifestyle in Marion, Indiana. A search of military burial records does not turn up an interment for Joseph in the Marion National Cemetery; although George Fries states he is buried there. Further research is warranted. Status: Located; This church was first organized in 1828, and it's location is only a mile or so from the Patton and Hoover farms. Much research has gone into this church--but we are still unsure if it was a church that the Hoovers or Pattons attended. Most likely, it is not--but research is continuing. Status: Located; Thomas Riley's name is engraved on one of the stones of this monument. Obituary of William Riley -- Marion Leader Tribune, July 2, 1926. Funeral Services for William Riley, 43, former Marion man, who was accidentally electrocuted in South Bend Tuesday afternoon, will be held at the St. Paul's church of Marion at 8 o'clock Saturday morning with Father Durham in charge. Burial will be at the St. Paul of the Cross cemetery at Columbia City, where the electrocuted man was born. The body arrived in marion last night at 5:05, and was taken to the home of a sister, Mrs. J.E. Walters, 622 Wabash avenue. 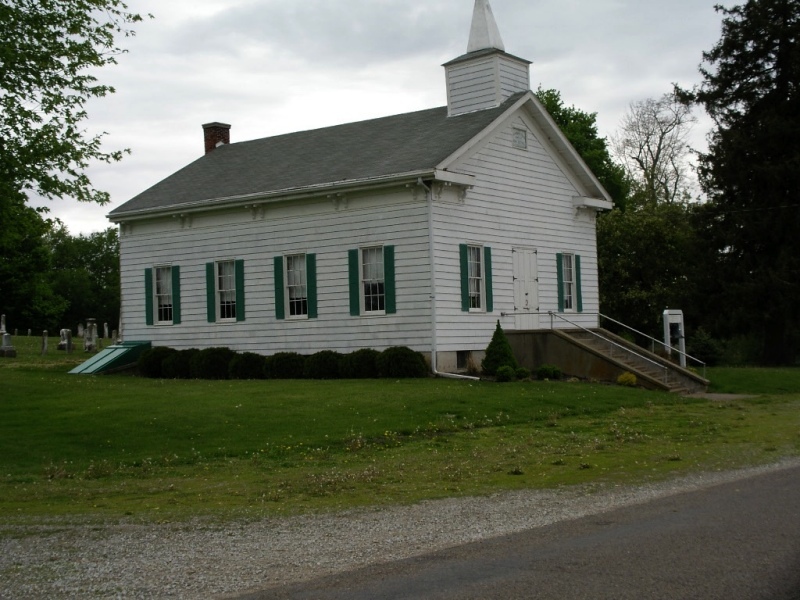 In 1706, owing to the lack of the established church on the northern shore of the Elk River, the colonial legislature and governor of Maryland established the North Elk Parish. As was the custom in England, the Lord of the Manor on which the parish was to be located, in this case, Henry Harford, the illegitimate son of Frederick, Lord Baltimore, set aside four acres of land for the establishment of the church buildings. Early survey maps indicate that sometime between 1709 and 1715 a wooden church was built on this land, the site of the present church, but no details about this first building are known. The Reverend Jonas Auren, a Swedish Lutheran clergyman, came to New Sweden late in the 1600's and stayed in America until his death in 1713. Most of this time he was in Cecil County (founded in 1674), preaching for a congregation of English, Swedes, and Finns. This congregation became the congregation of St. Mary Anne's, and the Rev. Mr. Auren its first Rector. Upon her death in 1714, Queen Anne bequeathed a sum to be used to establish the Anglican Church in the colonies. St. Mary's received a large Bible, a Book of Common Prayer, and a silver chalice and Paten from this source which are still used on occasion today. It is thought that gratitude for these gifts brought about the addition of Anne to the church's name, resulting in the unique name, St. Mary Anne's. In 1743, the Vestry contracted with Henry Baker for the building of a brick church, at a cost of 300 pounds, to replace the old wooden structure. A detailed description of this building can be found in the minutes of the Vestry dated March 1, 1743, and, except for the bell tower, which was added later, the church which was built is the church you see today. Taken from "The History of Whitley County" the names of Joseph Fries and Franklin Freese are shown as survivors from Company E, 17th Indiana Volunteers. I is unlikely that Joseph would have attended the functions referenced had he been a deserter. According to Leo Fries, the nephew of Joseph Fries: After leaving the fighting of the Civil War Joseph enlisted with General Sheridan to fight indians on the western frontier. According to Leo, Joseph was badly wounded, but survived the fighting. Following is the story of the Battle of Beacher Island. In an indecisive but bitterly fought battle at this site, a force of about 50 frontiersmen under Maj. George A. Forsyth engaged more than 1,000 Sioux and Cheyennes, led by Roman Nose, Pawnee Killer, and other chiefs. Pursued all the way from Fort Wallace, Kans., on September 16, 1868, the Indians turned on the troops, who entrenched themselves on a small sandy island in the Arikaree River. During the 9-day siege and the repeated Indian charges that followed, volunteers worked their way through enemy lines to obtain reinforcements from Fort Wallace, 125 miles away, who drove off the Indians. Casualties were heavy on both sides. Half the soldiers were wounded, Forsyth four times. The dead included Roman Nose and Lt. Frederick W. Beecher, after whom the island came to be named. Immediately after this battle, Maj. Gen. Philip H. Sheridan began his 1868-69 winter campaign. The island has long since disappeared because of shifting river channels, but a large monument near the post office at the town of Beecher Island commemorates the battle. Status: Located; Frank often spelled his name as Friese, while many of the family chose the abbreviated spelling of Fries. Other variations of the family surname also appear in public documents; likely because most name spelling was phonetic, with many persons in this era not fully literate in reading and writing.